Jay Gonzalez and Charlie Baker met in a debate Tuesday night. Governor Charlie Baker and Democratic challenger Jay Gonzalez tangled in a tense televised debate Tuesday, with each trading attacks on their bureaucratic resumes and framing the other as having the wrong vision for running state government. Throughout the one-hour forum, Gonzalez tried to tie Baker to President Trump, paint him as a GOP stooge, and criticize his tenure as falling woefully short of the challenges of our time, saying if he were to win on Nov. 6, he’d raise taxes on the wealthy and plow the new billions into education and transportation. Baker, who holds a massive lead in public opinion polls, aimed to parry the attacks, sharply criticized Gonzalez’s 3½-year tenure as state budget chief, and trumpeted his record over the last four years. The Republican weaved between his administration’s efforts to help homeless families, boost renewable energy, and increase funding for the state family social services agency and early education — each time rejecting the criticism that he’s a “status quo” leader. 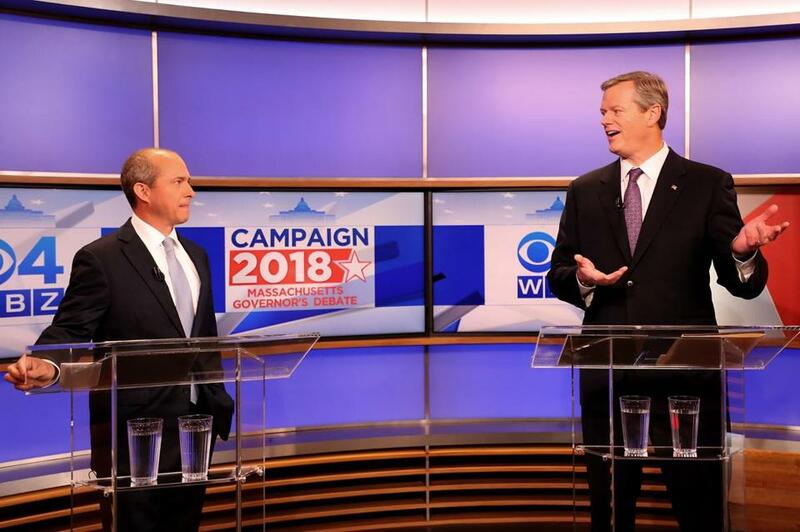 Although the debate aired on WSBK-TV (Channel 38) and overlapped with Tuesday’s Red Sox playoff game, it marked the highest-profile event of the previously sleepy governor’s race, and it gave Gonzalez and his attacks on Baker’s record one of the largest audiences to date. Baker jabbed at Gonzalez’s record, saying that as state budget chief under Deval Patrick he cut early childhood education funding by $85 million at the same time state spending was growing. Baker said his administration, on the other hand, had increased spending on early childhood education by over $100 million. Gonzalez tried to use the state’s blue hue to his advantage. Starting with the opening question, he repeatedly criticized Baker for his endorsement of the state’s Republican ticket, namely conservative state Representative Geoff Diehl, a Trump supporter who is vying to unseat Senator Elizabeth Warren. Gonzalez called Diehl a “rubber stamp for the Trump agenda” and said through his endorsement, Baker is backing an “anti-choice . . . pro-NRA agenda.” The Democrat echoed past criticisms he’s lobbed at Baker, calling him a hypocrite for backing Diehl, who lists “standing up to protect the Second Amendment” as a priority. “I would never support anyone like that who could go tip the balance in the United States Senate,” Gonzalez said. Baker — who has opposed several Trump administration initiatives and said he didn’t vote for the billionaire in 2016 — emphasized that he supports abortion rights. He also touted the “F” rating he’s received from the Gun Owners’ Action League, the National Rifle Association’s state affiliate. Several times, the debate — moderated by WBZ-TV political analyst Jon Keller — veered into a discussion of taxes. Gonzalez is pressing a plan to levy a 1.6 percent tax on endowments of any private, nonprofit college or university with a fund of more than $1 billion. If the plan were in place, he has said, it would have taxed Harvard University, MIT, Boston College, Boston University, Williams College, Amherst College, Tufts University, Smith College, and Wellesley College, generating roughly $1 billion in revenue. Baker argued that Gonzalez’s priorities, from pumping more money into transportation to boosting education spending, could cost tens of billions of dollars — a price tag Gonzalez rejected. The Republican noted that Gonzalez’s support of a millionaires tax wouldn’t even come to fruition in his first term because of state constitutional requirements. Baker also cast criticism on his plan to tax college endowments by trying to tie Gonzalez to — among all things — Republicans. The plan, he said, was “actually originally proposed by President Trump and the Republican Congress,” a nod to the 1.4 percent levy enacted on the investment earnings of high-endowment institutions as part of the tax overhaul bill Trump signed last year. Baker and Gonzalez, both former health insurance executives and state budget chiefs, also dove into wonky territory. Gonzalez talked about megawatts from wind power and the MBTA’s “state of good repair.” Baker spoke of “signals and switches, and third rail” and cited the number of investigations conducted by the Department of Public Utilities. Scandals at the Massachusetts State Police also surfaced. In reply, Baker said Democrats have called Gonzalez’s demands “political nonsense,” and underscored that the current head of the agency, State Police Colonel Kerry Gilpin, had referred 48 Troopers to the attorney general and US attorney for investigation.